If you need help - or if you would like to just read about the features that come with Costa - you can check out the included documentation. Every aspect of Costa is well documented, and there's even a couple of tips in there you might not know about. Developed by Jacob Palm, a Danish hobby developer known in the QB/GUI community as "The Walrus". Former maintainer of JacobPalm.dk GUI Reviews, one of the largest QB GUI sites at its time. 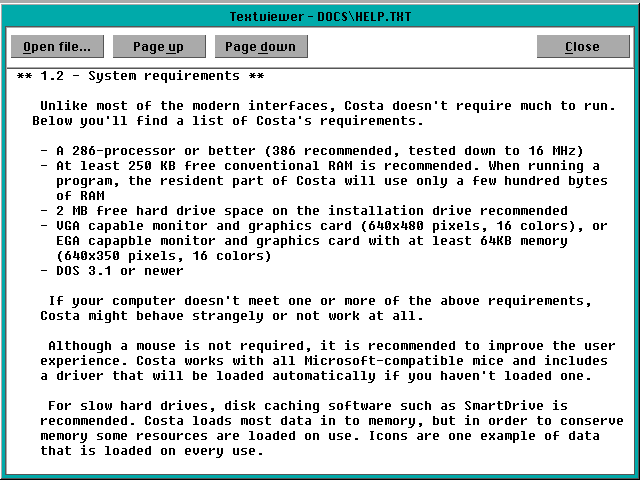 Costa is a small and lightweight GUI (Graphical User Interface) for MS-DOS compatible systems, provided to you free of charge. Site and software © 2004-2018 by Jacob Palm.